Megan Riera is a calligrapher, designer and stationer, based in Surrey and London. She started teaching workshops three years ago, and enjoys passing on her knowledge and passion for modern calligraphy. Her simple, fluid style has attracted clients such as Giorgio Armani, MAC Cosmetics, Ted Baker and Marks and Spencer. 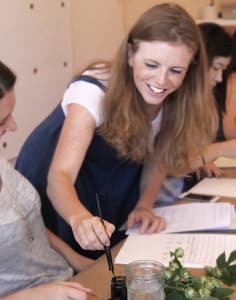 Having taught 100s of students whilst previously working for Quill London, and running workshops for businesses such as Boden and The White Company, she is now holding her own regular 'Introduction to Modern Calligraphy' classes in Clapham and Surrey. the workshop was held in a beautiful and quaint cafe with nice music and food. megan herself was very inspiring and patient as well, and she provided us with good quality materials and advice on what extra materials we can get if we want to. thoroughly enjoyed myself! Had a great time with my friends, really enjoyed it!